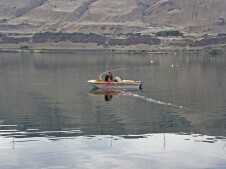 Fishers check their net on the Columbia River. The Columbia is a river of many uses. Sometimes these different uses inadvertently come into conflict. Fortunately, most of these conflicts can be prevented by knowing what to look for and avoid. Each year during the Indian fishery seasons, fishing nets can be found in the Columbia; run-ins with fishing gear can damage nets and outboard motors and endanger lives. To avoid conflicts, learn how to identify fishing nets. Most often, people notice the buoys that are used to secure the nets. These remain in the water throughout the year and are secured to the riverbed. Nets are only attached to them for a few days a week during an active fishery. It’s a safe bet that there will be an Indian fishery from the end of August to the end of September, however other fisheries can open throughout the year. While the nets themselves are not visible, the buoys and floats that hold up the nets are. The nets are stationary and may be attached to shore or anchored in open water. Nets may run parallel or perpendicular to the shore. Indian fishers pulling a salmon net from the Columbia River. Indians have fished, gathered, hunted and lived on the Columbia River for thousands of years. Today, tribal members still fish from scaffolds along the river and with small boats and nets. The United States government agreed to secure the tribal fishery when the Nez Perce, Umatilla, Yakama and Warm Springs tribes signed treaties with the United States’ representatives in 1855. The United States continues to defend the tribes’ fishing rights, which have been affirmed many times by many courts including the U.S. Supreme Court. Salmon play an integral part of tribal religion, culture and commerce, and of our spiritual and cultural identity. The tribal longhouses and churches rely on salmon for traditional religious services. Over the years, Indian fishers have had their gear vandalized, their buoys or nets cut from their moorings, or been personally threatened for exercising their treaty right to fish on the Columbia River. In the past, these types of activities were unfortunately the product of intolerance. Nowadays these actions more likely come from the mistaken belief that people are helping the salmon by preventing Indians from catching them. The number of salmon that the tribes harvest is carefully regulated to ensure that enough fish pass through the river system to return to spawn. Pacific Northwest fisheries are co-managed by tribal, federal and state government agencies that coordinate, adopt, and enforce fishing regulations, including domestic and international treaties governing harvest shares. The Columbia Basin’s fisheries managers are also engaged in the world’s largest salmon restoration program, which is rebuilding for returning salmon. 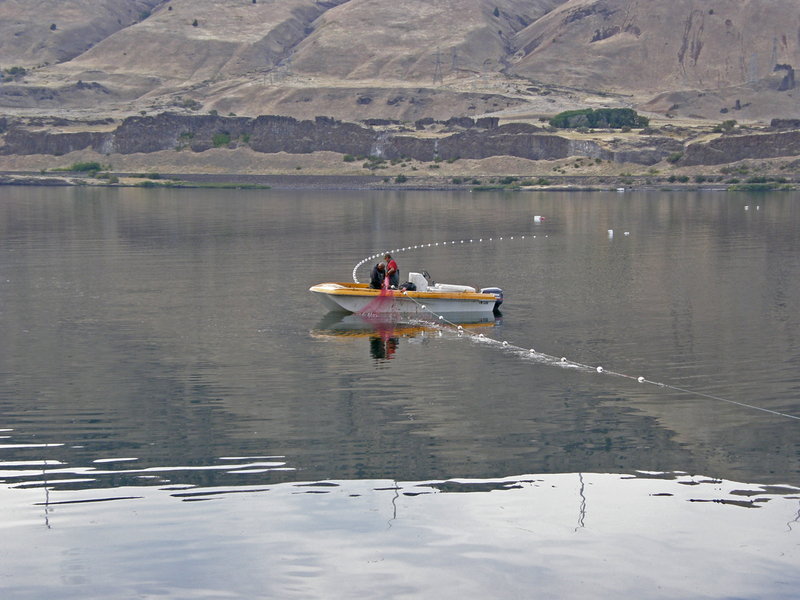 For the Indian fishery status, check here or subscribe to the columbiasalmon twitter feed. The openings are usually announced at least 24 hours prior. Before you enter the water, take a quick scan of the river for buoys or floats and keep an eye out for them while you’re in the water. Pass buoys on the OUTSIDE (away from shore), as sometimes the weight of the catch can lower the net floats just below the surface. Keep a 10- to 20-foot clearance of the float lines and NEVER try to pass over a net. Don’t assume that fishers in boats working their nets or transporting their catch can see you. If you need emergency assistance, call 911. If you have questions for tribal law enforcement, please call (541) 386-6363. Don’t assume that since you may have gotten to a river location earlier in the day than an Indian fisher that you have dibs on that spot. The net locations aren’t first-come-first-served. Each site’s exact location is documented and legally registered to individual fishers by their tribe and cannot be moved. 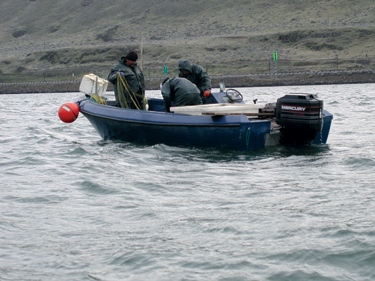 Allow Indian fishers access for boat launching. Try to stay out of the way of fish being sold or unloaded. Make room for fishers who have spread their nets for cleaning and repair. Never cut shoreline ropes or ropes that are attached to buoys or nets.